Tired of redesigning your site only to get zero results? No sales, bad UX experience and no ROI increase? Perhaps even a decreased ROI after redesigning your site? You’ve come to the right place. Our conversion-centered website redesign method guarantees results in weeks, not months. Test, analyze and redesign your website to improve conversions with the best CRO agency in town. Designing or redesigning a website without conversion in mind is like paying more for your underwear than you pay for your tux. It’s like tossing money off the back of a train. So, having a website CRO agency with the experience and proven results is… the right thing to do. A client’s lead gen website saw a 250% increase in demo requests for their SaaS products within four months of starting their data-driven redesign. Ready to contact your future website CRO agency? There is no reason to begin a website redesign without knowing for certain that it will improve leads, sales or revenue. 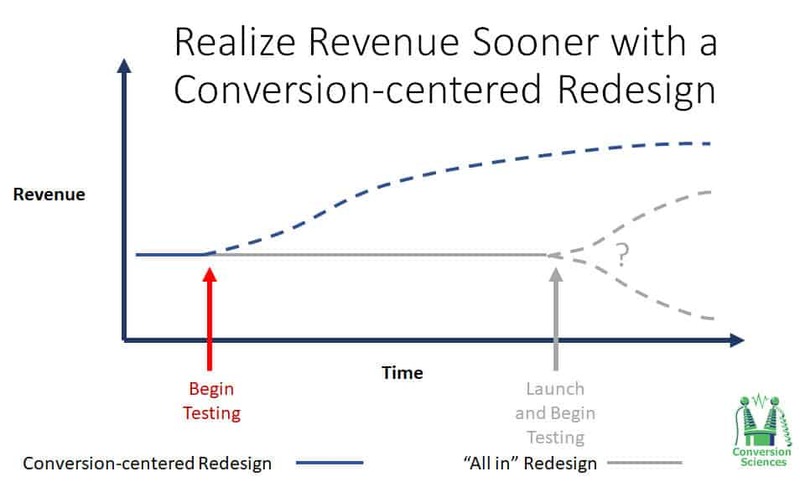 A data­-driven, conversion-focused redesign will end the cycle of failed redesigns. And we can make some pretty extraordinary claims about website redesigns for the right customers. Our redesign process delivers results in weeks, not months. There is no waiting until the website is finished. We put you on the march to website revenue growth, month after month. The redesigned website will deliver more leads, more sales and more revenue. Guaranteed. We end redesign surprises. We will redesign your site for a fixed monthly price. No change orders or price overruns. You can stop the redesign process at any time, reducing your financial risk. The improvements in performance are measured using science and analytics at every step. And, to top it all off, we work with your CMS,­ WordPress, Magento, Big Commerce, ASP.net, Joomla, Drupal, Shopify and others. Get started on the road to website redesign success. Jump on a Call with the Conversion Scientists. Our redesign process is a “front­end” process. We change the UX, the design, the copy, the images and the customer journey to redesign the site over time. Most redesign efforts require the design team and the development team to make a lot of assumptions. Code everything into one big ball. Finally, shove that ball of assumptions onto unsuspecting visitors. Most businesses are relieved if they don’t lower their sales and conversions. Not only is this dangerous, it takes months to push out a redesign, often more than a year. Why not test out each major design assumption, one at a time, and start getting increased conversions immediately? More Leads, More Sales and More Revenue — Faster. Our customer analysis process will inform the redesign process and achieve results like these. Worthington Direct redesigned their website as part of a rebranding. We did a conversion-­focused analysis of the existing website to guide their redesign. The new design delivered a 22% increase in transactions and a 13% increase in revenue. So, What Does Conversion-Centered Design Really Mean? Before conversion-centered design, we developed websites around user segments. Nowadays, providing a pleasant experience for users is not enough. Your business need visitors to take action to meet its goals. Conversion-centered design (CCD) is laser-focused to elicit a specific action from your visitors. It improves your customer’s experience while providing you with better converting landing pages. After all, aren’t all your website pages landing pages? Meet your business goals. Redesign your Website with Conversion in Mind. Don’t let your visitors go to your competitor’s site. Help them convert. They want it. You want it. A better UX experience translates into better converting landing pages. Turtle Bay Resort is located on the storied north shore of Oahu, Hawaii. Golf is an important part of their business. The page on their site meticulously listed the rates and golf tee times. After reviewing several recorded sessions, we found that the user experience from these landing pages was driving golfers away. A simple change made it easy for golfers to book a tee time. Most UX improvements are good for the business, as well as the visitor. More leads, more sales and more revenue. Want Better Converting Landing Pages? Most website developers pay little to no attention to the most crucial moment on the sales funnel. The Shopping Cart. Do you want your customers to leave their whole shopping experience in a basket to never return? eCommerce shopping cart design should be handled by conversion specialists. A CRO Agency with proven results. Find out more about our work with eCommerce sites. You developed outstanding campaigns. You brought visitors to your website. It may look pretty, but it doesn’t deliver. And you have to prove ROI to your boss. Let us show you what it’s like to redesign with data. Data-driven redesign is not wild guessing. It involves coming up with a series of hypotheses and testing them to identify what works before making the final move. It’s like owning a crystal ball, but without the fluff. Contact us to discover how redesigning with data can transform your website. Take your business from zero to sixty in weeks. The only way to find out how much growth you can achieve through Optimization is to have a call with one of our expert Conversion Scientists ™. Call us now at 888-961-6604 or complete the form below to schedule your free Optimization Consultation.